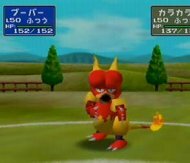 Pocket Monsters Stadium is called Pokesta in Japan. --Pokesta only uses 40 of the 151 Pokemon in the battles. However, all Pokemon will be able to be used in Pokemon Stadium 2! --We will be getting what was Pokemon Stadium 2 in Japan. It's just retiled Pokemon Stadium. This is so because there are more features in PS 2. --Would you have preferred the older version?! This will be a total 3-d game! The game data from the Game Boy game, Pokemon (Red, Blue, and Yellow), can be converted to PS! There's a little gadget that will enable you to transfer the data via the memory card port in your controller. What does this mean? --That means that all the Pokemon you caught in your GB game will be able to fight in the Stadium! 3-D style! AND... .You can battle your friends' Pokemon too on Stadium! The Transfer Pak is included with the game!! Compatible with Pokemon Red/Blue and Yellow. Data exchange via Transfer Pak. Now the game will be fought in a turn-based style. Players select the move and then watch the mayhem happen! Battle commands are executed using the A, B, and C buttons. A brings you to the attack selection screen, where you pick from your Pokemon's four featured attacks that you taught it by pressing one of the C Buttons. For example, pressing C Up when using Jigglypuff triggers her song, C Down is a tackle, C Left is another attack, and so on. The Pokemon typed attacks are TOO in play also! You can poison, sleep, hypnotize, burn, freeze, and etc your way to victory! You will be able to change your pokemon like the game boy game for another one that you prepared on your team. But of course you forfeit your turn... So preparation for ALL types of pokemon is important as always! The key to victory is balance! Also, in Pokemon Stadium you will be able to train your Pokemon through mini-training games! Cool 'eh? More info on these as when we get our hands on the game! Now of course we have mentioned that you can transfer your Pokemon from the Game Boy games. But what if you do not have them? 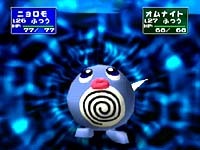 Well Pokemon Stadium allows you to use 'rental pokemon' for battle. The game was mainly dedicated to feature YOUR pokemon from the Game Boy games so you can use them to battle in the glory that is 3-d! This mode is easy to play even if you're not familiar with the Pokémon games. This is a kind of learning mode, to break you gently into the game and teach you the basics, so you can later graduate to fighting with your own monsters. You can only pick rental monsters of equal level in this mode. The Pokémon league mode, set against a time limit. The two settings you can control are the "fight time-limit" and the "technique-entry time-limit." Fights can be set to last from 5 to 90 minutes and you can give yourself (and opponents) anything from 10 to 90 seconds in which to enter their next technique (fighting move) . If you're both still standing when the fight time runs out, the monster with the most HP remaining wins the bout. This mode is exclusive to the US version. Here, you can take pictures of your Pokémon, store them on your cartridge, view them in hi-res and even create stickers. You select from a 4x4 or 16x1 sticker setup -- then take your cart to a local Blockbuster to have them printed out. This mode allows you to organize a Pokémon album and load monster data with your Game Boy. Plug the Game Boy Pokémon cartridge into the Transfer Pak and load the monster data, then view the monsters in full polygonal 3D. You can also move items and creatures between your Game Boy's storage boxes and the N64 cart. You can even trade Pokémon with your friends using an on-screen "trading machine". This tournament mode sees you do battle six trophies with Gym Leaders from the Game Boy game. Pit six of your monsters up against six of your opponents at various difficulty levels. There are nine types of mini-games in this mode. Like the regular battle mode, you don't need detailed knowledge of the Pokémon universe to enjoy them. You can participate with up to four players, and you don't even need to use the Game Boy cartridge to play this mode. If there are fewer than four of you playing, the CPU makes up the numbers. A tag-team battle mode for up to four players, this mode is the sequel's star attraction. Pitching players in a 2 Vs 2 tag-team match, each person gets to choose three of the fighters from a team of six. With up to 12 different types of Pokémon in the field, it's essential to have a good all-round knowledge of the different monsters' capabilities. Here, you can play the Game Boy Pokémon games using your N64. Essentially, the GB Tower is a software emulator that displays the action of the Game Boy game on screen in limited , similar to a Super Game Boy. Remember that it will only play Pokémon Blue, Red and Yellow, though. See a listing of all the tournament winners, sorted by creature type. Pokémon Stadium 2 is set to pump out the same excellent 3D, 60fps visuals as its predecessor. The Pokémon square off in various fighting areas where they will pull off amazing attacks, such as Pikachu's lightning bolts that will literally light up the screen with its 11,000 volt glory. Developer HAL created simplistic stadium backdrops (based on locations that appear in the Game Boy titles) in order to free up a lot of polygons for the actual monsters themselves. Using soft-skinning technology and super-smooth animation (including some pretty impressive morphing routines), the Pokémon move even more realistic than in the anime series. Finally, the game will also utilize Factor 5's patented M.O.R.T. voice compression to give the stadium announcer a huge vocabulary to accurately describe what's going on in the arena. Sadly, the number of Pokémon voice samples is limited to "Pika!" and generic monster screams. -A Look at the expanded 1-player mode! 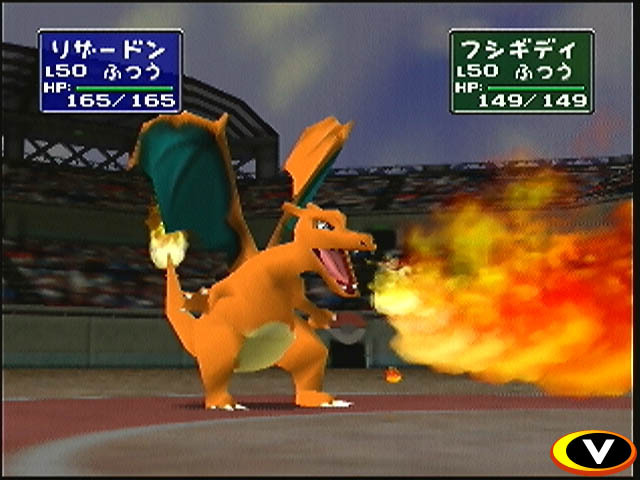 Nintendo has been busy tuning up Pokémon Stadium for its North American release next month. In addition to adding the new photography mode, NOA has modified the game's central Stadium mode. While the mode's focus remains on two-player combat, the one-player mode has been augmented with a new Cup to challenge. In the English version of PokéSta, the Stadium mode will consist of four Cups: the Pika Cup, the Petit Cup, the Poké Cup, and the Prime Cup. Each Cup has its own entrance requirements. The Pika Cup is only open to Pokémon with a level between 15 and 20; the total level of the three Pokémon you fight with cannot exceed 50. The Petit Cup allows unevolved Pokémon between levels 25 and 30 who weigh less than 44 pounds. The Poké Cup features Pokémon of levels 50 to 55, with no other special restrictions. Finally, the Prime Cup is open to all Pokémon; expect to see level 100 hardhitters here. In the first two Cups (Pika and Petit), players will battle a series of eight trainers, earning one of the eight badges after each battle. (Battles are conducted according to the Gym Leader Castle's three Pokémon rule.) No continues are alloted initially, but if you win a battle without any of your Pokémon fainting, you'll earn a continue that allows you to replay a battle without restarting the entire Cup. The latter two Cups up the ante by requiring you to earn all eight badges four times -- once in the Poké Ball class, once in the Great Ball, once in Ultra Ball, and Master Ball. Again, continues must be earned; lose a battle without any continues in stock and you'll have to start the Cup all over. What do you get for winning all four Cups? 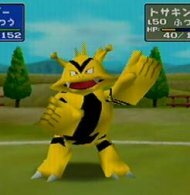 We're not telling (okay, so we actually don't know), but you can find out when Pokémon Stadium ships on March 6th. Another new Game mode for the US Version! Another new game mode has been announced for inclusion in Nintendo's soon-to-be-released Pokémon Stadium: the Gym Leader Castle. Here, one human player battles against a series of computer-controlled trainers. There are eight Gyms, each of which contains four trainers (the Gym Leader plus three underlings), followed by a final battle against the Elite Four and Gary. Once a Gym is completed, the next one is opened permanently (even if you later lose), but each time you lose in the middle of a Gym, you'll have to begin that Gym from the beginning. The rules in the Castle are almost the same as a regular Pokémon battle, except that both you and your opponent are only allowed three Pokémon per battle instead of six. Before each battle, you'll be able to look over both your and your opponent's six-Pokémon rosters and select which trio you want to use; however, you won't know which specific three Pokémon your opponent is using until the battle actually begins. Also, only one of each type of Pokémon is allowed in your group of six -- but who would want to use more than one, anyway? Your reward for victory? Every time you defeat the Elite Four and Gary, you're awarded one of eight randomly-selected Pokémon, which is transferred into your attached Game Boy cartridge and saved to your game there. The available Pokémon include Bulbasaur, Charmander, Squirtle, Hitmonlee, Hitmonchan, Eevee, Omanyte, and Kabuto. All of these Pokémon are ones that cannot be caught in the wild in the Red and Blue versions, making them valuable prizes for trainers looking to complete their collection.